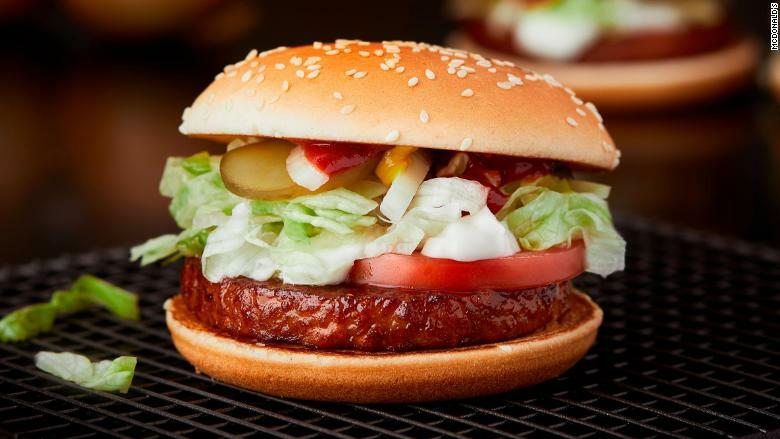 The fast food chain plans to start selling a McVegan burger in hundreds of restaurants across Sweden and Finland starting on December 28. The sandwich, which has already been tested at a handful of McDonald's locations in Finland, consists of a soy patty, bun, tomato, lettuce, pickles, onion, ketchup, mustard, oil and an egg-less sandwich sauce. "Like our other burgers, the McVegan is tasty and has a good texture," said McDonald's (MCD) spokesperson Henrik Nerell. The meatless burger, which was developed in partnership with a specialty Norwegian food company called Orkla, could help the American chain capitalize on increased demand for vegetarian and vegan foods. McDonald's said the burger will be on its permanent menu in the two countries, a response to "more and more" people wanting to eat "plant-based food" that is better for the environment. 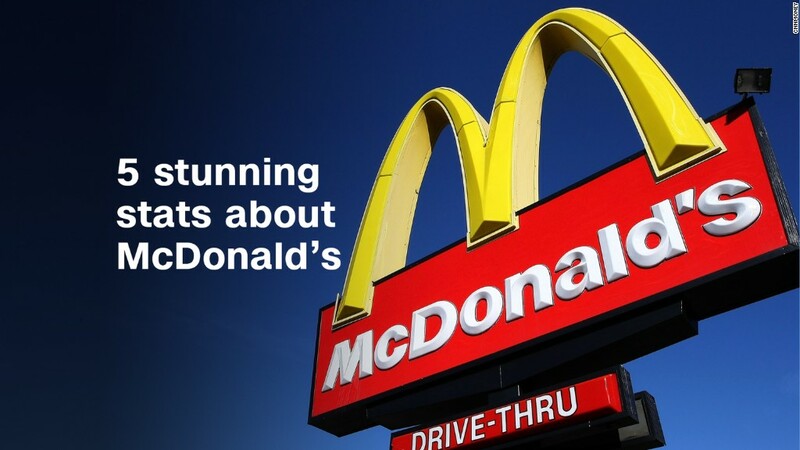 "As the main ingredient is plant-based, the McVegan is considered to have a smaller climate impact," McDonald's said. Livestock farming is responsible for around 14.5% of global greenhouse gas emissions, according to the UN. The McDonald's McVegan burger is set to launch in Sweden and Finland on December 28. 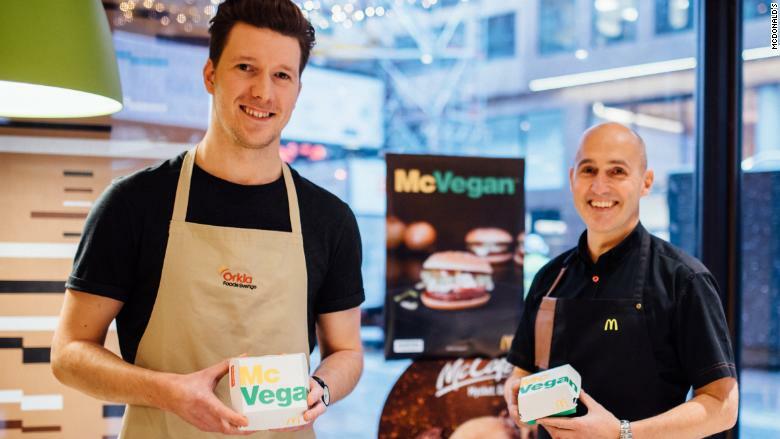 Mikael Malkamaki, a 24-year-old student who tried the McVegan during its test run in Finland, said he was impressed by the taste. "I would say it tasted like a normal, regular hamburger," said Malkamaki, who is concerned about the environmental impact of meat. "I would seriously try the McVegan again because there wasn't such a big difference between the burgers." The McVegan burger was created through a McDonald's collaboration with Orkla, a Norwegian food company. McDonald's isn't the only food company to jump on the vegan diet, which involves cutting out all meat, milk, eggs and animal products. Nearly 10% of new food launches in Sweden this year were vegan items, according to research firm Mintel. That's up nearly eight-fold from 2012. Nestle (NSRGY) announced in September it was buying the specialty food company Sweet Earth, which makes vegan and vegetarian burritos and burgers. "As many as 50% of consumers now are seeking more plant-based foods in their diet and 40% are open to reducing their traditional meat consumption," Paul Grimwood, CEO of Nestle USA, said at the time. Global sales of vegan-labeled foods increased by nearly 8% last year to $12.8 billion, according to research firm Euromonitor. -- Ivana Kottasova contributed to this report.